Garrett Zavala and his motorcycle. Motorcycle photo by Dean Sullivan. One man is dead after a car collided with a motorcycle in Los Osos on Wednesday, causing the motorcyclist to fly about 150 feet. At about 5:30 p.m., Garrett Zavala, 36, was allegedly driving at speeds of more than 90 mph in a residential neighborhood, according to the CHP. 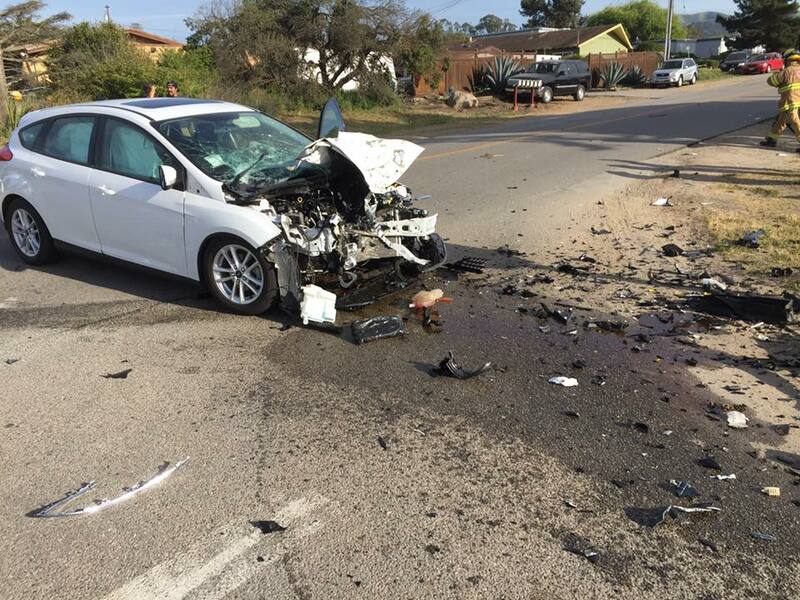 At the same time, a Los Osos woman who was driving a Ford Focus northbound on 9th Street slowed down to turn left onto Nipomo Avenue. Zavala was speeding southbound on 9th Street toward Nipomo Avenue, when his motorcycle collided head-on with the Focus. 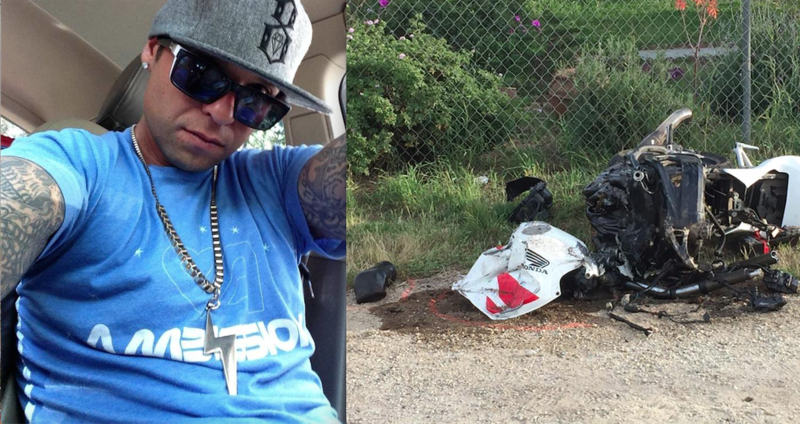 Upon impact, Zavala was thrown about 150 feet up 9th Street. The driver of the Focus suffered minor injuries. An investigation into the crash is ongoing. It is unclear if drugs or alcohol factored into the collision. I think everyone is appalled at this young man driving 90 mph on a 25. But lets not forget his family and friends that now contend with his death. Apathy at the loss of life is the expression of an insensitive heart. HE has paid for his mistake. For those who are lacking empathy…. For the Family, I hope you can someway find Peace during this difficult time. My sympathy and prayers over your Huge loss. For the driver of the Focus, I say a prayer for you to be comforted, knowing your Angels were protecting you from serious harm. My heart cries for the stress and trauma you are forced to endure. Bikes are becoming the bad new “norm”. I am not saying this young man did not have some fault in his own decisions, but just take a look at all of the garbage being displayed in the popular media. From bikey gangs on t.v. to x games backflips and nitro circus, even facebook is infected with people doing dangerous things on motorcycles. Of course children are going to grow up watching this nonsense and think it is a great idea when the adults are all pushing it into their lives. Time to grow up as a society. Sorry no pity! he could have hit and killed a kid walking from school. I noticed CCN deleted many posts showing a lack of concern for the man and that is fine but sorry. I have no patients for people that risk the health and safety of others just for a thrill. Putting someone down with name calling, simply reveals your own low self esteem. I didn’t call anyone a name. The little old lady had the scare of her life. I hope she is doing ok.
Fine upstanding looking young man. Nice when individuals like this do us all a favor without harm to bystanders. I doubt that the driver of the Focus would begin to agree with you about the “without harm” part. I doubt you would feel unharmed in their place. What is wrong with you? People referring to a person who just died as an idiot or knuckle head and saying things like “Fine upstanding looking young man. Nice when individuals like this do us all a favor without harm to bystanders.” WTF yes, he made a terrible decision. Yes, he died due to that decision and harmed another person. BUT, he was someones son, brother, grandson, nephew, friend. He wasn’t just the person who made a bad decision yesterday and payed the ultimate price. He was a person, with a life. Stop being so damn self righteous behind your keyboard at home while you sniff your own farts and drink your coffee. From the decade I spent (12-22yrs old) knowing him he was funny and kind and stood up for his friends. I had a lot of good times with this dude. Yes his life went in a bad direction at some point but don’t demonize him in his death. We all make bad decisions at some point. some worse than others but no one is perfect. Stop being a jerk. O.k. so by your reasoning it is harsh calling him a knucklehead?? Should we have waited for a more appropriate time when someone could have hit and killed someone’s innocent kid that didn’t make a BAD decision? Yea you can be a fine human being every day of the week BUT a bad decision is a BAD decision and 90 in a 25 residential area? Sorry you are a KNUCKLEHEAD!!! You must either not have kids or you have zero insight into anything. Ye without sin, cast the first stone…..
Yea and drunk driving must be o.k. then by that reasoning huh?? Sorry to hear about this young man. Attention Sheriff Department: start taking action against this type of activity that happens all the time in Los Osos. You are responsible for some or the “wild west” vibe in Los Osos where motorcycles rip through the streets. Nipomo, Willow, and the grid are becoming a haven for bikers, tuners, and gearheads racing around with no fear of penalty. Step up enforcement. Don’t expect the Sheriff Parkinson to do anything about this since they don’t even stop their own deputies from driving drunk, at over 100mph, with their gun and a passenger. With Deputy Fellows actions to follow with no consequences it is not surprising others act just as dangerously. Maybe Deputy Fellows knew this guy since his drunk driving seems to be done in the same area. Likely this was not the first time he drove his motorcycle recklessly and with no regard for others around and likely he could care less. The Sheriff’s Department should take note on this, as it happened very close to their station. Los Osos has way too many speeding motorcycles. Every time I hear a speeding/accelerating motorcycle, I listen for an impact. 90 mph in a residential neighborhood that in most cases would be 25 mph? Amazing the knucklehead only killed himself and no one else.